Classic Ceilings has announced that the company has introduced two new lines of creative and easy to install moldings: Curtain Profiles and Quick Clips. These products are currently available for purchase on the company’s website. Classic Ceilings, today, announced the addition of Curtain Profiles and Quick Clips to its range of easy to install moldings. The company has made the products available for purchase online at crownmoldings.net along with video tutorials to assist customers in installing their products. Classic Ceilings’ decorative home kits are designed to simplify DIY projects by providing all the parts that are required to handle projects from entry ways to entire crown packages for rooms of many sizes. They also include the Quick Clips that can be angled, making it easier than ever to install. The Quick Clips crown moldings collection is a patented, award-winning, revolutionary molding installation system that changes the way that molding is installed. It requires no nail holes to patch, no adhesive, and uses molding blocks to eliminate the need to miter corners. This makes for a fast and easy installation process that is ideally suited to the DIYer. The Quick-Clip crown molding system can be installed as-is or by using the pre-made inside corner blocks. These are considered as add-on block options which can be added on to any DIY home kit for an additional cost. Classic Ceilings has also added Orac Decor® Curtain Profiles to its product line. These Curtain Profiles make it possible for DIYers to hide the curtain rails for an elegant finish. There is no additional construction needed thanks to the built-in features which glue the Curtain Profiles directly onto your walls and ceiling. The design of these Curtain Profiles allows you to integrate them as a cornice molding for your walls. With an extra beam, they also provide support for a solid connection. Orac Decor® Curtain Profiles and Quick Clips are currently in-stock on the company’s website. 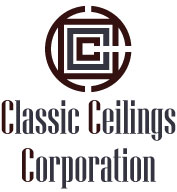 Although certain Classic Ceilings products are made to order, the company says that it does make a note on the product pages of the specific products that this stipulation applies to. However, Classic Ceilings encourages customers to call to confirm stock availability for all time-sensitive projects. To learn more about these new products available from Classic Ceilings customers may visit the website to watch the installation video tutorials and order samples. Classic Ceilings customer service representatives are also on standby to answer any questions regarding these new products. About Classic Ceilings: Classic Ceilings is a California-based retailer of decorative architectural ornaments. Their product lines include a full range of decorative DIY kits along with ceiling elements, moldings, entry and window systems, and columns. The site also provides installation videos to assist customers in installing their products. To learn more about the products offered by Classic Ceilings, go to crownmoldings.net.